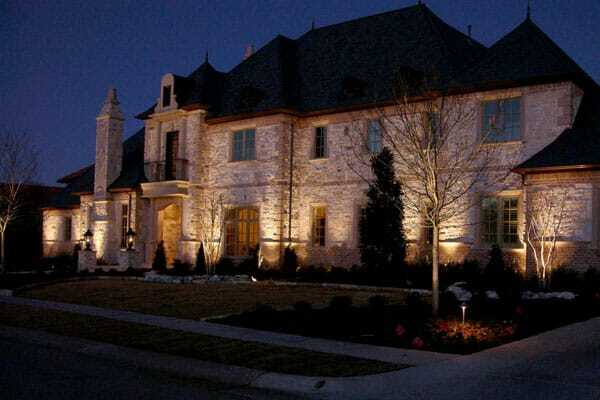 Having great outdoor LED and low voltage lighting options can really help make your Keller, TX property shine at night. Bring a little bit of twilight to your garden or install security lighting you can rely on. Our outdoor lighting options are environmentally friendly, low voltage lighting solutions to keep your property safe and beautiful. Using low voltage LED lighting is a great way to save money and still have excellent lighting options that are bright and help you see your way around your wonderful Keller yard. Unlike standard, incandescent bulbs, LED landscape lighting is cool to the touch and uses very little electricity. This type of lighting also lasts a long time, so you won’t need to replace your lights very often or worry about maintenance. No matter what kind of weather you experience, you can count on your LED lighting to be resilient and beautiful for your Keller Texas home. Keller, TX is a beautiful and affluent location. As part of the metroplex that makes up the Dallas-Ft. Worth area, it offers a lot of great, big-city amenities but it also gives you a small town charm that you won’t be able to get in a larger place. If you like to get out and spend time in the community, there is a huge aquatic and recreation center along with a municipal service center, great shopping, local restaurants, and the beauty of nature in the parks and green spaces. Keller has been around since early in the 1850s and has built itself into a community where there is mostly a residential feel, with very little industry. That lends itself to good air and water quality, and a strong community where people enjoy spending time with their neighbors. From the malls and downtown shops to the parks and green spaces, Keller is a wonderful place to call home. George and his team with Creative Nightscapes single handedly transformed our front and backyard living spaces with a custom design that even exceeded our expectations! I would highly recommend Creative Nightscapes to transform your exterior lighting and outdoor living space. Great job done by George and his team!! Lighting - Front and Back yard. I have shopped for lights and am so Happy that I found Creative Night Scapes. My house looks amazing and the quality of the product is outstanding. I can not wait for my friends, neighbors and family to see how wonderful it looks. Jerry was very professional and knowledgeable. He listen to what we wanted and his team delivered. The installation team showed up on time and were very respectful to our property. They were very quick and when they were done you could not even tell they were there. If you ever need landscaping lights these are the people you want to use. Thanks Jerry and team for a the quality job you did for us. 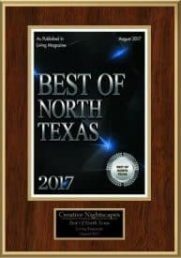 Jerry and team at Creative Nightscapes did a great job from start to finish. They were on time for all appointments (estimates and installation) as well as follow up. Jerry was VERY easy to work with and helped guide us to the right exterior lighting solutions for our home. Our house looks beautiful at night! Best decision I have made in a while. Patrick designed a great accent scheme to our new back yard and his crew were quick, clean, and respectful. Very professional, on time. Delivered just as promised. Highly recommend. Great and fast service at a good price!! Removed existing lighting system and installed new Kichler LED outdoor landscape lighting at home in Danbury Parks. Placed up lights to accent facade of home, peaks, entry way, second story facade, porch columns, porte cochere columns, dormer, and tree canopies. Set path lights to highlight walkways, front step, and landscape greenery. Installed Kichler LED outdoor lighting at home in Quail Valley Estates. Placed up lights to accent the facade of home, Holly trees, and Crepe Myrtle. Mounted down lights in the eave to highlight the driveway parking area. Removed existing high voltage lights and installed low voltage, Kichler LED landscape lighting at home in Estates of Lyndhurst. Placed up lights to accent facade of home, peak of home, and various trees. Mounted down light and hardscape lights under eaves to highlight the back yard fireplace, seating area, and patio. Removed all Malibu lighting and installed Kichler LED outdoor landscape lighting at home in Quail Valley Estates. Placed up lights in front of home to accent the facade, columns, and grand entry. Installed Kichler LED outdoor lighting at home in Hatcher Estates. Placed up lights to accent tree canopies. Mounted down lights in trees and under eaves to create a moonlight effect and illuminate the driveway entry, Juniper trees, and back yard. Installed up and down tree lighting in keller. Down lighting circular drive. Installing Kichler LED lighting on front and backyard of home in Keller. Up lights to accent front of home and trees. Lights mounted in waves to accent driveway and backyard deck areas. Up lights on palm trees behind pool. Installed Kichler LED outdoor lighting at home in Keys Addition. Placed up lights to accent facade of home, peaks, and Holly trees. Set wash lights to highlight planters and landscape greenery. Mounted down lights to create moonlight effect and illuminate walkways and yard. Installed Kichler LED landscape lighting at home in Timberview Estates. Placed up lights to accent facade of home and various trees in front and back. Mounted down lights and hardscapes to create moonlighting and illuminate driveway parking area, garage, walkway and steps to front door, deck, outdoor kitchen, seating area, and steps. Set path lights to highlight driveway and walkways. Installed Kichler LED outdoor lighting at Highland Creek Estates. Placed up lights to accent entrance sign and trees. Set path lights and up lights to highlight Crepe Myrtles, walkway and landscape greenery in pool area. Mounted down lights in trees at playground area to create moonlight effect and illuminate the area for fun, safety, and security. Installed Kichler outdoor landscape lighting at home in Lakes of Highland Oaks. Placed up lights to accent facade of home, columns at front entry, canopies of Oak trees, and peaks of home. Mounted down lights in tree to create moonlight effect and illuminate steps to front door. Set wash lights in back yard to accent landscape greenery and Banana trees. Removed existing high-voltage lighting. Installed Kichler LED lighting at home in Overton Ridge. Placed up lights to accent facade of home, columns, dormer elevation above entry, trees in front yard, and trees in back yard. Mounted down lights in eaves to illuminate the pool deck. Set path lights to highlight steps to front entry. Installed Kichler LED outdoor landscape lighting at home in Villas of Volterra. Placed up lights to accent trees in front yard and landscape near fence in back yard. Mounted hardscapes to highlight steps and deck area. Mounted down lights in eaves to accent stones and yard. Upgraded existing fixtures and installed new Kichler LED outdoor landscape lighting at home in Belaire Hills Estates. Mounted down lights to create moonlight effect and illuminate circle driveway, walkways in front and back, landscape greenery, and statues. Set wash lights to accent landscape, windmill, driftwood, and boulder. Mounted deck lights on brick wall to illuminate seating area. Installed Kichler LED outdoor lighting at a home in Woodlands at Hidden Lakes. Placed up lights in back yard to accent Oak trees. Installed Kichler LED outdoor lighting at home in Providence Grove. Placed up lights to accent the facade of home, front entry, peaks, turret, and trees. Mounted down lights in eaves to illuminate driveway area, landscaping, and yard left of pool. Set wash lights behind pool to accent landscape greenery. Upgraded existing lights to LED and installed new Kichler LED outdoor lighting at home in Preserve at Hidden Lakes. Placed up lights to accent Large Oak trees, Crepe Myrtle, Wax Myrtle, and art pieces on side of house. Mounted down lights to create moonlighting and illuminate yard, and landscape greenery. Set path lights to highlight landscaping near pool, behind kitchen, and near front entry. Installed Kichler LED outdoor lighting at home in Marshall Ridge. Placed up lights to accent the facade of home, garage area, columns, and trees. Set a path light to highlight the landscape bed at garage and driveway. Mounted a down light under eave to illuminate the side yard and gate entry. Installed Kichler LED outdoor lighting at home in The Keys. Placed up lights to accent the facade of home, columns, and Oak trees. Mounted down lights to creating moonlighting and highlight the pool deck, spa area, playground, walkway, and yard area. Set a path light to illuminate the walkway to the front entry. Installed Kichler LED outdoor lighting at home in Fall Creek Estates. Mounted down lights in back yard to accent yard. Placed up lights in front and side yards to accent peaks, facade of home, Oak trees, and Wax Myrtles. Removed existing fixtures and installed low-voltage, Kichler LED landscape lighting at home in Williamsburg Estates. Mounted down lights and hardscapes to create moonlighting, illuminate walkways, steps, planters, seating area, fire pit, and pool deck. Placed up lights to accent facade of home, peaks, columns, Magnolia tree, and Japanese Maple trees.